One of the things that makes RV travel so great is the sense of feeling right at home, no matter where you are! Your home-on-wheels allows you all of the comforts of a traditional home, with the freedom of the open road. And a major part of this comfort is temperature control—especially while traveling in the summer. Picture this: you’ve just gotten back from a long day on a humid Florida beach, or from wandering in the dry heat of the Arizona desert, and all you want is to relax in the comfort of your RV. This sounds great, but what if your RV air conditioner unit wasn’t working? All of that summer adventure with none of the pay-off of a comfortably cool home-on-wheels? No thanks! 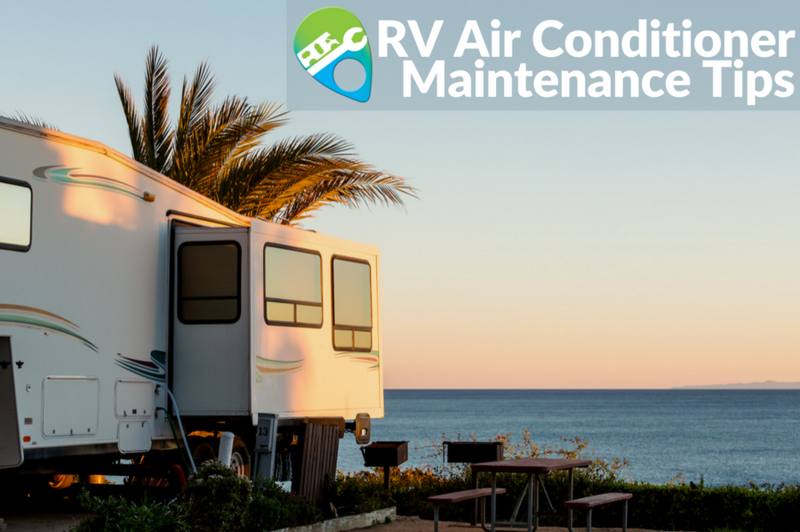 In this article, we’ll go over some of the quick and easy ways you can regularly maintain your RV A/C to keep it functioning all summer long! Before you hit the road for your summer fun, do a quick visual inspection of the outside of your air conditioning units. Ensure there are no cracks or tears in the plastic that covers your RV air conditioner. If you do notice some unexpected openings, there’s a good chance that winter weather found its way into your air conditioning unit, which is likely to cause problems down the line. If the plastic looks broken or weak, make sure you bring your rig into a local RV Repair Facility to have the system checked out. You may need to replace the A/C shell from time to time, as it is vulnerable to all types of weather and physical damage over time. If everything looks good outside, head into your rig to inspect the A/C mounted on the roof of your RV. You should be able to easily remove the plastic cover, and clean up the inside. Filters can be gently washed with soapy water, and placed back into your unit for added use. You’ll also want to clean up any remaining dust or debris from the plastic cover before re-attaching. Every few years you will need to access the cooling fins on your RV air conditioner for deep cleaning. These finds become clogged with dirt, and make it difficult for your AC unit to produce the cool air you’re looking for. To perform this task, you’ll need a good spray cleaner, a shop vac, and a steady hand. Close the vent leading down to the interior of your unit, then use your cleaner and shop vac to loosen and remove dirt and dust. Be very gentle with this task, as the fins bend easily, and bent fins will not allow your RV air conditioner to function properly. RV A/C units don’t last forever, but keeping them in good shape through simple maintenance can help your air conditioner live a long and happy life! Remember, you should only ever perform maintenance on your rig that you feel comfortable with. If digging into A/C fins feels out of your wheelhouse, any licensed RV Repair Center in your area will be happy to perform this yearly maintenance on your air conditioner. Once your A/C unit is inspected and cleaned, the only thing left to do is hit the road, and chase down an unforgettable summer!